Sopra un metodo facilissimo di riproduzione fotografica delle sezioni istologische. Journal : Zeitschrift für wissenschaftliche Mikroskopie ; vol. v.
Braunschweig : Harald Bruhn, 1888. Description : 335-336 p., [1 l.] pl. ; ill.: 9 phot. figs. ; 25 cm. Photograph : 9 collotypes [Lichtdruck] on 1 printed leaf. Photographer : Dr. Arnaldo Trambusti. Subject : Central nervous system — Histological preparations ; Photography. Author caption: Pel Dottr. Arnaldo Trambusti, assistente di anatomia Patologica nell'Università di Pisa. Con Tavola II (v. Plate 2). Photo caption: Lichtdruck von Kühl & Co., Frankfurt a. M.
Reference: de Giaxa, "Ueber eine einfache Methode zur Reproduction der Koch'schen Kulturplatten" (v. Page 700). 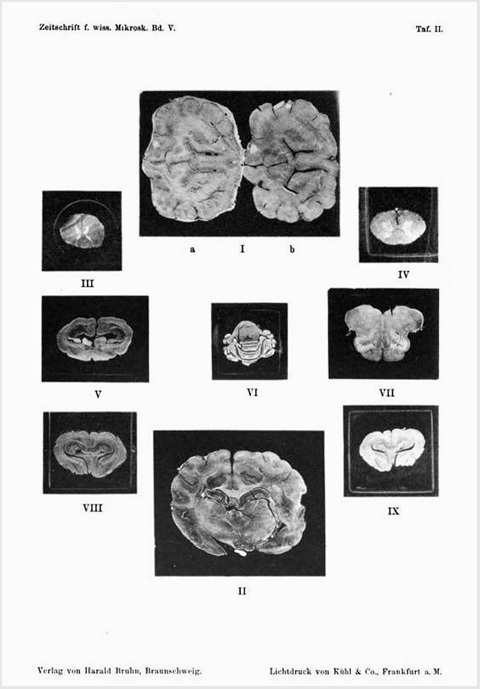 Represented are nine histological preparations from the spines and lower brains of rabbit, ox, dog, and human. Trambusti adapted de Giaxi's method of photographing Koch cultures, dispensing with the negative by placing the glass culture plate directly on the positive. The method was no different than that employed by the first leaf printers who often chose fern fronds as negatives. Because of the translucency of Trambusti's tissue samples, he stained with carmine or hematoxylin before exposing.